Go ahead, take a deep breath and celebrate, Private Practice fans: this ABC drama has been renewed for a sixth season. So, without the possibility of tomorrow night's "Gone, Baby, Gone" serving as a series finale, what can fans expect from the episode? "Amelia goes into labor," Paul Adelstein told me on the phone last week. "And that's a big deal, obviously, given what she's going through… it will be revealed to everybody and there will be a disagreement over the ethics of that. Things get pretty heated." Where will Cooper come down on the controversial topic? "From a medical standpoint, he's such a child advocate," the actor said. "The upside of saving all those children really appeals to him." 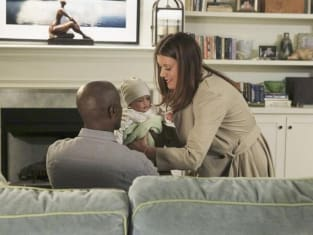 Meanwhile, Cooper, Mason and Charlotte will continue "figuring out how to be a family," Adelstein said, acknowledging that his character's main storyline on season five has "certainly not been what I expected." "It's been a great journey for Cooper," Adelstein said, looking back over the course of the series. "You saw someone at the beginning with a lot of potential, but he was still a man child, for lack of a better term… then he fell in love with this great woman and discovered he had a child and that's something he always wanted. He's really incorporated that into his growing experience." And nothing symbolizes that experience more than Cooper's priorities, Adelstein explained. Just look at his focus ever since Mason came into his life. "He was really worried over whether Charlotte would take to being a mother. She was just thrust into that role… So he's enjoyed a great deal of relief and joy at seeing her step up to it and really development a deep love for Mason, and vice versa." Similarly, Cooper and Charlotte have developed a deep love for one another, which is a rarity on a Shonda Rhimes show. They are simply… happy. Together and happy. "We thought it would be a rocky relationship," Adelstein said when the couple first got together. "And there's been some backsliding. But both had huge happenings in their lives - her father died, she was assaulted and raped - and they really came together as a result... Sometimes opposites just make such a strong bond. I just totally buy them a couple." Private Practice airs its season finale tomorrow night on ABC. I'm like that... all bomb-shelly. Permalink: I'm like that... all bomb-shelly. I am shocked by just how much I genuinely love him. I want to take the pain away, and I know I can't and it just kills me. Private Practice Round Table: "Gone, Baby, Gone"